Dear candidates, if you have applied for the MP CPCT November Exam 2017 then here is good news for you. The Madhya Pradesh Agency for Promotion of Information Technology has declared the dates of this test. According to the official information, this exam will be organized on 18th & 19th November 2017. However, the MP CPCT Admit Card 2017 will be released shortly by the examination authority. 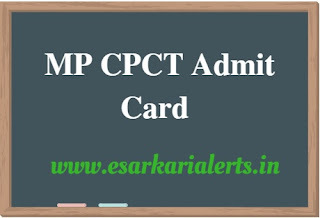 The candidates can easily download the MP CPCT Hall Ticket with the help of this web page that is well-created by the squad of www.esarkarialerts.in. As you can see that in any kind of examination, candidates must have their admit card/hall ticket in order to participate in the exam. The contenders, who fail to show their admit card, don’t get the entry in the examination center. Accordingly, it is being considered as an important document for the exam. So, if you want to make use of this great chance then collect your hall ticket before the examination. The complete details on your exam and admit card are furnished below. Check the complete details by scrolling down your page. The MP CPCT is the short name of Madhya Pradesh Computer Proficiency & Certification Test. This test has been introduced in the Madhya Pradesh State to assess the Computer Proficiency and Typing Skills of the candidates of government jobs. This exam is being organized by the Madhya Pradesh Agency for Promotion of Information Technology (MAP_IT). A large number of candidates have submitted their forms for the MP CPCT November Exam. At present, such candidates are looking tensioned about the MP CPCT November Hall Ticket 2017 that will be available soon. There will be total 75 questions in the examination. The questions in this test will be Multi Choice Questions (MCQs). There will be two typing skill assessment, English Typing Test, and Hindi Typing Test. Firstly, browse “www.cpct.mp.gov.in” in your internet browser. Later then, click “Existing User” button. Just fill up your “User ID” & “Password” correctly and press the “Login” button. Now, click on the “Application Form” tab. Thereafter, tap on the “Action” button. Then, click the “Hall Ticket” tab. Afterward, you have to select the “Assessment Date (test date)” and click on the “search” button. Now, tap the “Download” button. After downloading the MP CPCT Admit Card 2017, don’t forget to take a hard copy of it so that you can carry the same in the examination. All the Best of your Exam!!! Thanks for visiting www.esarkarialerts.in.